Two years ago, we picked up a load of 2×6 T&G flooring at an outdoor salvage yard and have kept in stored in tents and the carport, moving it around the yard seemingly a dozen times. Next we needed to figure out how to create joists that didn’t take up much headroom and went with the character of the house. Logs, of course. At the time, there weren’t any copies of this book available, so I had to get one via interlibrary loan from the Fairbanks, AK public library – the only copy I could find in the country! 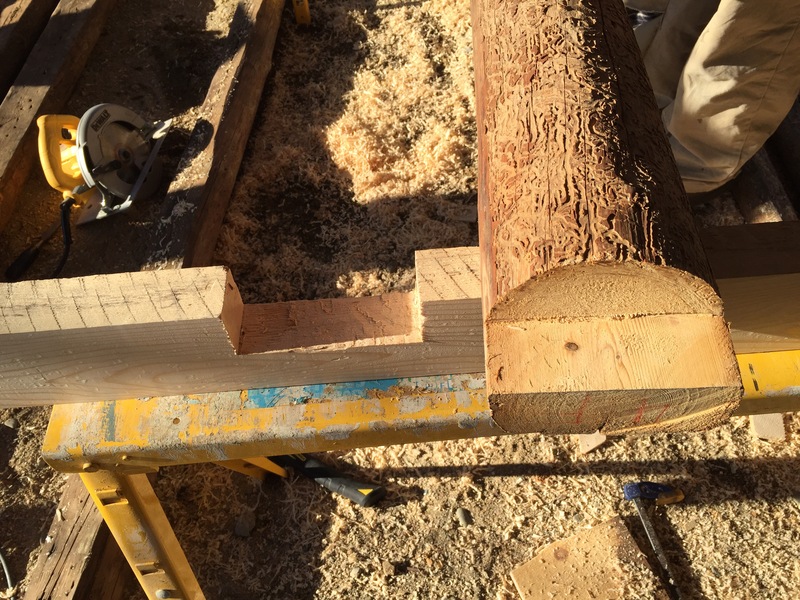 We learned that even with soft cedar or spruce logs, we only needed logs that were about 4″ at midbeam for this application, which allowed us to consider using a small, simple ledger system that could fit in the header between two log courses on the back wall of the house. Now we just needed those logs! Finally, we planed all the floorboards – which are a mixed old un-used salvage lot including pine, fir, cedar, hemlock, and oak – to as close as we could to the same thickness. The goal was to have a rustic, attic-plank-y floor, so perfection was not needed (or happening). Of course it started snowing while we planed them, but luckily we have the carport to work in now. Yesss! And we attached the floorboards yesterday. Now it’s all of the trim work, paint touch-up, decor, and building in some storage and we’ll have a nice little guest sleeping loft/hideaway/storage solution. We’ll wait until summer to urethane it all, when we can sleep outside and let things air out. Other back corner (first “before” photo view): after. We will close in the pipes. Another favorite: not a knot in it. Big reveal soon! This project is on schedule so far. Winter break has begun! What could we possibly be building this year? Hint: today’s prep tasks included washing these lovely antique logs outdoors in the barely-above-freezing weather. We’re waiting for the garage to be what one might call “well organized” before the big reveal – we are still moving items in from all the nooks and crannies where we’ve been storing them, and selling some extra stuff, so it’s a bit of a work in progress. It’s December already?! Thanksgiving happened. We had dinner here in the little cabin with K’s folks. Instead of turkey, we enjoyed baked stuffed scallops, grilled veggies with a roasted red pepper sauce, and artichoke risotto. The backsplash was from a used bench base we bought. Finally, even though it’s gotten cold and reminded us why we need to wear gloves to work in winter, we got several things done today: installed exterior window and door trim for the garage (used up leftover salvaged wood from the cabin and old barn boards we dragged here from the other house), sealed up the window openings with spray foam, weatherstripped the door, and changed out the door knob so we can finally lock the garage. Progess! We’ll stain and caulk the trims if we get a warm day, or else in spring. In all, there are four windows. The original design we were given had just one (! ), but we picked up four windows in a lot with our garage door for super-cheap (we actually got 5 windows plus the garage door for less than half of a new door + 1 window), and we’re so happy to have much better cross-ventilation and light with all the windows. Door trim! Some painting needs doing to get things to match. Rear window: I have a spare set of shutters that will bring this to scale. Street side windows: salvaged trim is perfectly proportioned.